This tutorial has been created to go over whats needed to configure the non-licensed version of the g729 codec. This codec would normally cost a license fee, but recently the patent expired, which allows the codec to be used without paying a license fee. 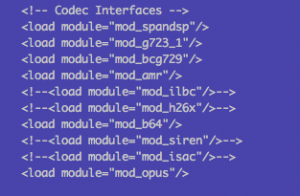 The file should like the following when complete – Notice the third load module statement. It now contains the license free mod_bcg729 module versus the mod_g729 module. In /etc/freeswitch/vars.xml please replace mod_g729 with mod_bcg729. Within the same config file edit the following line following line to ensure g729 is a preferred codec along with any other codec you have installed. If the install has been done correctly you should be able to use g729 codec without an issue.